Remember my dilemma early this month trying to decide which wallpaper to buy for a project I had going? Well I made my decision and guess what? With the help of my sister, we put it up last Sunday. I had never attempted it before. It took us 4 hours to do this little section at the back of the new shop. It was hard work. And you really have to concentrate at all times. But it was fun and I would recommend anyone giving it a go. What do you think? Hope your weekend is filled with greatness. I am exhausted ! More fun going up than coming down. The picture of the wallpaper didn't come up til after I commented. OH, I love it. It is starting to look good. What fun you must be having getting your shop all ready and in your own style. It looks like the perfect choice for your shop - it totally suits your style. Love it! Congrats on the new shop Simone, cant wait to see it finished and in action! It's absolutely PERFECT - love it! Love the wallpaper! Wallpaper is a lot of work, but so worth it. Would love to find out the details on the pattern. Wallpapering is not an easy job- especially when u are dealing w/a pattern that repeats every few inches, crooked walls, corners, etc... That paper is so you!. ....WONDERFUL...I am sooooo excited for you!...keep posting your hard work! to be the same pattern as your wallpaper! i would say a perfect match! looking forward to seeing more of your space! Hi Simone, the wallpaper looks great! Well done to you and your sister. Your shop is really coming together for you and I can't wait to come and visit! Have a relaxing weekend. It is BEAUTIFUL!! I am so excited to watch your adventure unfold, & am so glad you are sharing it with us!! Looking forward to seeing more...and hope you get a little rest!! I love what wallpaper can do to a room but I'm terrified of the process! Reminds me of The I Love Lucy epsisode when Lucy and Ethel are hanging wallpaper. It is totally Simone!! I love it. That looks fabulous. Great choice, looks much more 'vintage' now! Oh my gosh! It's sooooo cute! So homey! I love it! L.O.V.E it Simone, that was my choice from your samples and it looks even better than in the sample. It looks very pretty, and I know it's hard work putting it up. My friend once said that putting up wallpaper with your husband might cause you to end up divorced :-) I don't think it's that bad, but it might cause am argument or two. 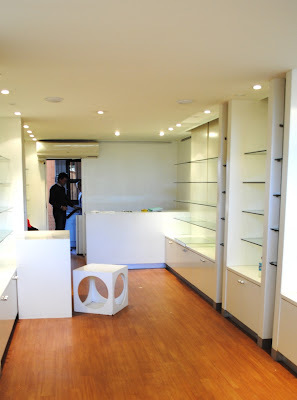 You are going to have so much fun with your shop. Love your wallpaper choice. It's so "you". Your shop is going to be wonderful. I wish you much success. Sorry I have not been by in awhile. I have been working on some commissioned pieces and tend to become "single minded" when I begin painting. Poor MacDaddy, I forget about preparing meals, too (and he's been in town a lot this summer). also meant to say WELL DONE on your soap/candle range..
HEY I have heaps of ideas..but need computer help from my sons to start with!! Looks great! You gals did a super job! I think the wallpaper is fantastic and your style. I´ll be waiting for the final result. Kisses, Ana ¡¡Happy Weekend!! it's just gorgeous - I love it. That's just fantastic. I adore the colours and the print. It doesn't surprise me in the least that you managed to pull this off in your first ever attempt. Can't wait to see more of your progress. Suspense is killing me to see what you decide to sell. Oh my dear...your shop is going to be amazing! I adore this wallpaper..I have put up many a wall of paper over my lifetime. When it was popular years ago my husband and I would team up. Now it is back and I have the BUG! I remember wp with my grandma when I was little..she loved the stuff...I wish I had all her old vintage rolls right now. Wow!! What a simple but big change !! Love it !! One word ... FABULOUS ... well worth the four hours! Wow! looks so great. I can't wait to see the store up and running and buzzing with excitement! I LOVE it! It's just beautiful! Congrats on the new venture, it is really starting to take shape now. This is so exciting! Can't wait to see more!! Aren't you brave. I would have to had hired someone or since I like quick change have stapled fabric to the wall. Simone it looks great. You 'girls' did a fabulous job. Looks so great!!!! And CONGRATS on your store!!!!! I forgot to leave a comment when I was catching up on your site last week! So exciting. I know it will be a huge success! It really makes a statement and in the most gorgeous way! 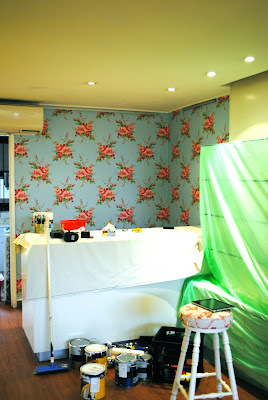 I have only helped my husband wallpaper but I agree it is very tedious work. I absolutely LOVE the wallpaper....it is really similar to something I am saving for the right wall in my next house.....in fact I thought it was the same one!! Hope the shop plans are going well, so excited for you!! it looks like hard work but so worth it. the paper is amazing!